Nebraska set a spring game attendance record when an announced crowd of 86,818 fans spent last Saturday in Memorial Stadium getting their first glimpse of new coach Scott Frost’s program. It was the largest crowd in Nebraska history for spring games, and the eighth highest-attended spring game nationally in modern history. Most anticipated was the first look at Frost’s pace-and-space offense. While clearly still in its infancy, we saw moments of its potential. We probably won’t see Frost’s offense truly clicking on all cylinders, consistently, until next season. Sure, there will be stretches when it looks like the finished product we can eventually expect to see, but we saw at UCF that it’s going to take a year for things to take hold. This is still a team full of players recruited to play in a huddle-based pro-style offense. This will be a transition year for the Cornhuskers. What we did see, though, was evidence that there are quarterbacks on this roster capable of growing in this system. Scott Frost and Mario Verduzco are now tasked with handing the keys over to the guy they think gives Nebraska the best chance to win in 2018. Perhaps just as important, they also need to take into account who has the highest ceiling. Nebraska has the toughest schedule in the country this coming season. Most fans are expecting 6-8 wins this year. The fanbase is so united behind Frost, I think he has two or three years to really make noise on a national level. I think fans would see the bigger picture and appreciate the foundation being laid even if the team goes 7-5 this year. I think it’s the perfect opportunity for the staff to groom and develop someone during this honeymoon period. Frost and Verduzco have reputations for developing quarterbacks. The three guys Frost has worked with as an offensive coordinator or head coach (Marcus Mariota, Vernon Adams, McKenzie Milton) excelled under his guidance. Mariota led the nation in pass efficiency in 2014 at Oregon with Frost coaching the position and calling plays. The next season, Adams led the nation in pass efficiency too. This past season, UCF’s Milton was second behind only Heisman Trophy winner Baker Mayfield. Verduzco spent 14 seasons at Northern Iowa. In that time, seven Panther quarterbacks combined for 13 all-conference awards, including Eric Sanders, the 2007 Missouri Valley Offensive Player of the Year who finished his career with the best completion percentage in FCS history, including an FCS-record 75.2 completion percentage in 2007. They don’t intend to make a decision any time soon. “The quarterback decision won’t come for a long time,” Frost said. “And I don’t think it’s fair to evaluate those guys until people are really familiar with the system.” That’s the best approach to take. “We want to evaluate the guys all through spring and all through fall camp. Got a group of guys that are doing some really good things, and I see improvement there every day, but we’re a long way from getting to the point where we’re about to evaluate starters,” he added. So how does the competition look over the next three to four months? Sophomore walk-on Andrew Bunch received some nice reviews for his work this spring, and if the Red-White game was any indication, he will be a serviceable backup capable of running this offense. Noah Vedral struggled a bit on Saturday, but he knows this offense inside and out and has the physical traits needed as well. I am assuming Vedral won’t win his waiver with the NCAA seeking immediate eligibility, so he’s not an option this season. For me, it boils down to the two guys with the highest ceilings on the roster: redshirt freshman Tristan Gebbia and true freshman Adrian Martinez. Gebbia and Martinez were the quarterbacks on the Red team. Troy Walters and Mario Verduzco said there was “no rhyme or reason” for why the quarterbacks were split the way they were. I don’t think that’s completely accurate. A few days before the staff set the teams, Frost revealed “We’re going to put the majority of the guys that are doing well on one side.” I think Frost wanted to see how those two would look in a game setting in front of 80,000 people. All while doing it behind four of the five likely starters on the offensive line. They were also throwing to the top group of receivers and lining up alongside Greg Bell, who I think will be the primary back when the season rolls around. The spring game showed that both Gebbia and Martinez are capable of making plays in the offense. He was the star of last year’s spring game. All things being equal, it was one of the more impressive spring game performances in recent memory. After being on campus for only three months – and being the youngest player on the team at the time – Gebbia threw for 268 yards and a touchdown on 28-of-45 passing, while rushing for another score, mostly against the No. 1 defense. He also did that while probably weighing 165-pounds. When Scott Frost came in and implemented the new offense, there were skeptics who questioned whether Gebbia could handle the run-game elements involved. “In our offense, you don’t need to be 4.4 (seconds in the 40-yard dash), you just need to be an effective runner,” Frost said. Frost and Verduzco value a strong cerebral grasp of the offense over any one physical trait. Gebbia definitely checks both those boxes. Gebbia earned the immediate reputation as a film junkie from the day he stepped on campus last spring. Those habits haven’t changed one bit. There were several reports this spring of him often being the last guy on the practice field, going over footwork and throwing to teammates or into a net at least a half hour after most workout days. There isn’t a quarterback – or player – on this team who will out-work or out-prepare Tristan Gebbia. While he’s not anywhere near the same league athletically as Adrian Martinez, I think he showed himself capable of working the zone read concepts in this offense. Gebbia showed he’s more than a capable runner, at least a lot better than he had been given credit for when Frost took over. A lot of the things that he does well still translate nicely in the new system. Gebbia worked the intermediate passing game with efficiency, something that is important in this offense. During the Red-White game, Gebbia connected on 12-of-17 passes for 125 yards and two touchdowns. Those numbers could have been even better. He threw a beautiful ball to Jaevon McQuitty for 37 yards up the left sideline over Tony Butler on the first play of the game, only to have it called back by a procedure penalty. Late in the second quarter, he also put a deep ball in a good spot for Mike Williams for what would have been a 41-yard touchdown before Butler interfered. Overall, he was poised spreading the ball around, something I fully expected. He has the best arm talent on the roster. He has developed his body considerably from last year, though he still has a ways to go. No true freshman has started a season opener for Nebraska in program history, although it has been done by Tommie Frazier (1992) and Cody Green (2009) by mid-season. Adrian Martinez might become the first. He has the physical tools, athletic ability and the maturity to handle it. He was also hand-picked by Scott Frost because he was such an ideal fit for the offense. Martinez was the very first offer this staff made to anyone. Within an hour or so of winning the AAC Championship, quarterbacks coach Mario Verduzco was on the phone offering Martinez a scholarship. “When I was evaluating quarterbacks for this class a long time ago, Adrian was my favorite guy in the country,” Frost said on signing day. The 6-foot-2, 205-pound Martinez was the highest-rated quarterback signee in the Big Ten according to the 247Sports composite. He received nearly 30 offers including Alabama, Georgia, Miami, Oklahoma, Tennessee and Oregon. As a junior, he accumulated 2,562 passing yards, 25 touchdowns and four interceptions, and added 1,462 rushing yards (8.0 per carry) and 14 more scores. Unfortunately, he didn’t play his senior year at Clovis West (Fresno, CA) after having shoulder surgery in March to repair a torn labrum. During spring practice, Frost said Martinez told him that he thought his arm was at about 90 percent. Personally, I don’t think it’s quite 90 percent yet. At one point, Frost told reporters that he’d seen some times where perhaps Martinez didn’t have the “steam” on some throws that he saw on Martinez’s high school tape. Martinez has said he thinks he’ll be at full strength soon. Hopefully that’s the case come start of fall camp. 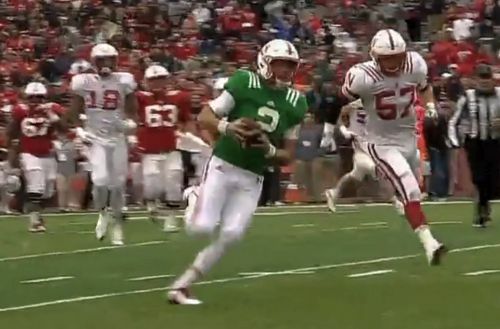 Make no mistake, Martinez came to Lincoln early to win the starting job. Never before has a coaching change happened at Nebraska where the new staff was able to recruit a highly touted signal caller to enroll early and match their system. Frost and his staff sold Martinez on that opportunity. He realized that he was walking into a unique situation. One where he would be afforded the chance to start on equal footing with every quarterback on the roster. A legit quarterback competition. This is the truest quarterback competition at Nebraska since at least 2010, and you could make a strong argument that Bo Pelini had Taylor Martinez earmarked for that job by the time they got to fall camp. Martinez stood out at the Red-White game. He displayed the talents that made Frost and Verduzco so excited on the recruiting trail. He finished 10-of-13 passing for 114 yards and a touchdown while rushing a game-high 14 times for 60 yards and three more scores. His rushing touchdowns came in every manner that this offense will provide: a 15-yard zone read, a 6-yard designed quarterback draw and a highlight reel 23-yard scamper up the right side that came on a designed pass. The dimension he adds with his feet stands out among the other guys in a big way. He is very natural with the read aspects of the offense. Martinez is on another level compared to everyone else on the roster, including Vedral. Consider too that he missed a year of competitive football, and is still not completely healthy. You never would have known from watching him on Saturday. Martinez is the prototype of what Frost will continue to recruit moving forward. He’s the type of quarterback Frost wants to build with going forward, but the question is can he play now? We’ve seen the way quarterbacks historically have taken a giant step in their second years running this system. Does Frost decide to roll with Martinez, knowing he has the highest ceiling in this offense? Should be a fun summer.